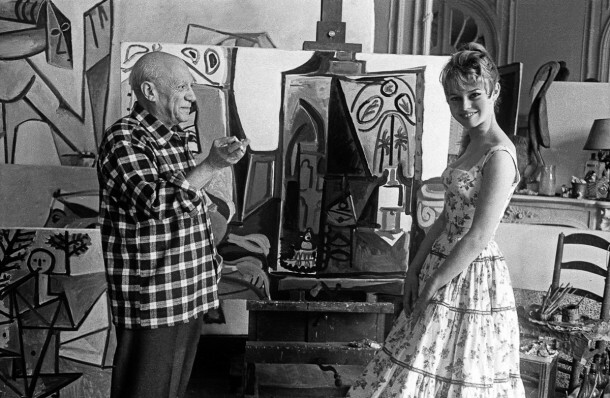 World Artists and their Story, 16 – Pablo Picasso | Marbella Marbella – Adelante! Pablo Picasso (1881-1973) has brought about revolutionary developments in the visual arts. Along with Henri Matisse and Marcel Duchamp, he has pointed the way out of a deadlock in the art at the beginning of the twentieth century. Since that time, there were new opportunities both for painting, sculpture, graphic art and ceramics. He practiced himself in all branches of art. Whether it was painting, graphics or ceramics, he all mastered them. Pablo Ruiz Picasso was born on October 25, 1881 in Malaga, on the Plaza de la Merced. He was the only son of the Bask art teacher José Ruiz y Blasco and his seven year younger Andalusian wife Maria Picasso y López. He was a beautiful baby. There were many compliments from neighbours, family and acquaintances. And that would never cease. His first words were, according to his mother, ‘Piz’, ‘Piz’, an abbreviation of Lápiz, ‘pencil’, ‘pencil’. José Ruiz y Blasco really wanted to teach his son drawing. He also took him to the Museum of Malaga where he was curator. When Pablo was ten years, the family moved to La Coruña (Galicia). His father found a job there as a drawing teacher at the new Da Guarda institute. A year later Pablo is allowed to the School of Fine Arts. He gets lessons from his father there in drawing ornaments. In 1895 the family moved to Barcelona and Pablo goes to the Academy of Art Llotja. In Madrid he discovered Velázquez and Goya. With his friend Manuel Pollares he has his first studio. In 1897, he passed the entrance exam at the Royal Academy in Madrid and that same year he holds his first exhibition. For his work with wavy lines and color areas reminiscent of Art Nouveau, he received rave reviews. At the Academy he also painted a series of traditional portraits and compositions of figures, but he soon had enough of that. That was also because he was out for eight months. He recovered from the effects of scarlet fever at farmers in a small village, Horta de San Juan in Catalonia. By chatting and eating with them he imperceptibly changed his style. When he is better he returns to Barcelona where he joins the editorial staff of the magazine El Quatre Gats, with poets and other artists. He makes his first graphic work and discovers Toulouse-Lautrec and Steinlen. In that world he feels right at home. After philosophical and artistic discussions Pablo and his friends go to Music tents and the prostitutes of Sarrio Chino, the red light district of Barcelona. At nineteen he leaves for Paris with his friend Casagenas. For a while they have a studio in Montmartre. They study the works of the Greek, Roman, and Egyptian rooms in the Louvre and the work of artists such as Bonnard , Toulouse-Lautrec in the galleries of Rue Lafitte. The following year he is for a short while back in Madrid where he founds the magazine Arte Joven. His friend Casagenas appears to have committed suicide in Paris and Picasso returns for Paris, where he exhibits, form June 25 to July 14, 65 artworks in Gallery Ambroise Vollard. Pablo settles permanently in Paris and makes a series of paintings that show an almost monochrome color blue. They are representations of everyday life with beggars, street singers and other street types in a matt blue that permeates the figures themselves. The work therefore seems imbued with melancholy. This period, the Blue Period, takes four years. From 1901 he signs his work with Picasso, the last name of his mother. In 1904 he settles in the Rue de Ravignan 13, now Place Goudeau. And befriended Guillaume Apollinaire, Derain, Gertrude Stein and Fernande Olivier, who for seven years will be his companion. The handsome and stately Fernande puts an end to the solitary figures of the blue period. They often visit the Montmartre cabaret Le Lapin Agile and the Circus Medrano. The Pink Period begins. He makes a trip to the Netherlands in Schoorl. 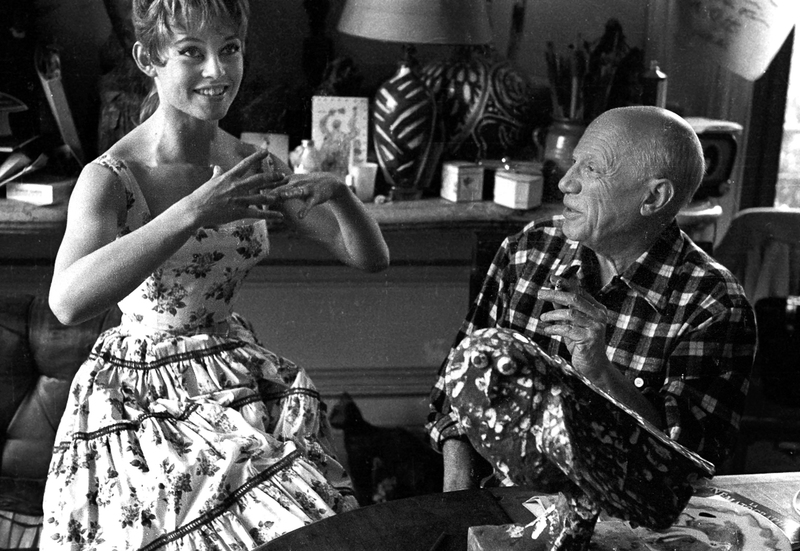 Picasso paints clowns and acrobats he saw almost every day in Circus Medrano. Color and composition change. The line became more important and the emphasis is more on precise design than displaying the mood. Blue gives way to bright pink and soft terracotta. Between 1906 and 1908 he paints plump woman persons, where he found inspiration for at Paul Cézanne and African art. His quest for primitive, original forms, had landed there. On vacation in Spain he meets Henri Matisse and Kahnweiler. And a little while later Braque. He studied the works of Cézanne. The paintings from the pink period were selling well. His poverty had finally come to an end. Then he makes what is now considered one of the key works of European art history: Les Demoiselles d’Avignon. The Demoiselles, girls of the night, worked in the Rue d’Avignon. The three ladies at the left are influenced by Iberian sculptures and the two at the right by African primitive art. With this painting, Cubism begins. With Georges Braque Picasso developed Cubism between 1907 and 1914, backed by art dealer Daniel Henry Kahnweiler (1884-1979). On Les Demoiselles d’Avignon, we see five women and in the foreground a still life. Their bodies and the still life are solved in cones, spheres and cylinders, the basic forms Cézanne saw in nature. The faces of the two women at the right were showed from two sides at once. 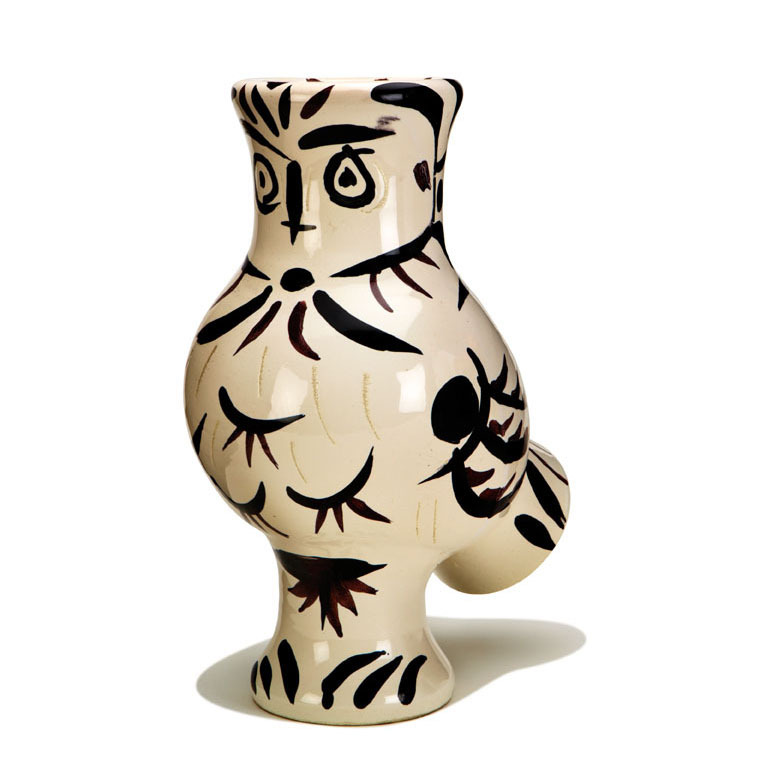 The works of Picasso and Braque were indistinguishable form each other in this period. They continued their research info form and the laws that rules here and developed the ‘analytical cubism’. What is the shape of a ‘thing in itself’? The next step was the breaking and unfolding of the form and then putting it back together. In 1911 he is with Braque in Céret and designs typographic characters. He begins with three-dimensional paintings and his papiers collés. And he falls in love with Marcelle Humbert (‘Eva’). Cubism continues to develop. With Braque he comes to the ‘Synthetic Cubism’, where they make collages of newspaper clippings with a few lines of paint added. The synthesis involved the fusion of reality and fiction which created something new. And in 1914 there is the ‘Rococo Cubism’with pointillist canvases. The First World War has arrived and Braque has enlisted in the army. Picasso, as a pacifist, doesn’t follow him. He became depressed and it got worse when Eva died in 1915 due to tuberculosis. He makes some realistic portraits in the style of Ingres. The following year he meets the Russian impresario Diaghilev and composer Erik Satie. For Diaghilev’s Ballet Russes, he makes set and costume designs. He takes inspiration in Pompeii, especially for the ballet ‘Parade’, a co-production of Jean Cocteau, Diaghilev, Erik Satie and the Russian Ballet. He marries in 1918 with one of the dancers of the ballet: Olga Koklova. Stimulated by his new wife, he throws himself info ‘La vie snob’. They move into an upscale neighbourhood and are the centerpiece of any living room. He doesn’t look back to his former friends. He goes to work in more directions, Cubism remains briefly and disappears largely in 1920. Neo-classicism sets the tone. In a classic style he paints women with heavy bodies. ‘Mother and Child’ was favorite. In 1921 his son Paolo is born. In 1923 he met André Breton and not much later he participated in the first exhibition of Surrealism in Paris. He was not a surrealist, but his work got a surreal atmosphere. For example in the work ‘Bathers’. In 1927 he started a relationship with the slim, blonde, seventeen-year-old Marie-Thérèse Walter. 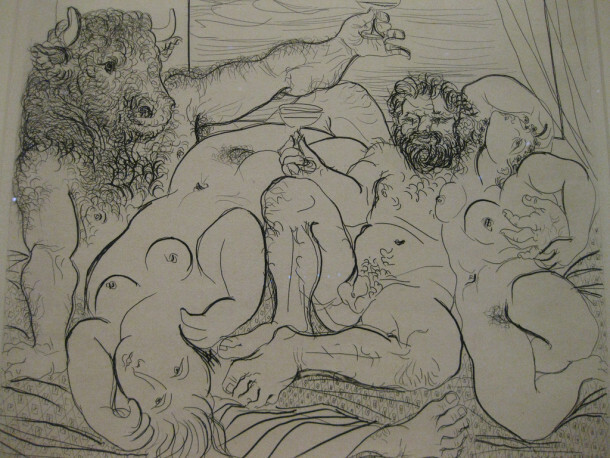 Symbolic motifs got more important and resulted in mythological scenes with the Minotaur, in which bull (as image of the man) and horse (as image of the woman) went together. He also became interested in the bullfight. In 1935 his daughter Maya is born. He is separated form Olga who doesn’t accept this and for decades blames and scolds him. He is appointed as director of the Prado, meets Dora Maar, photographer and makes experiences with photographic technique. The Spanish Civil War is in full swing. In 1937 he makes Guernica which is exhibited at the World Fair in Paris. 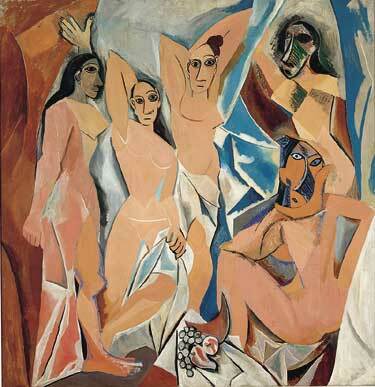 Les Demoiselles d’Avignon is bought by the MoMa in New York. 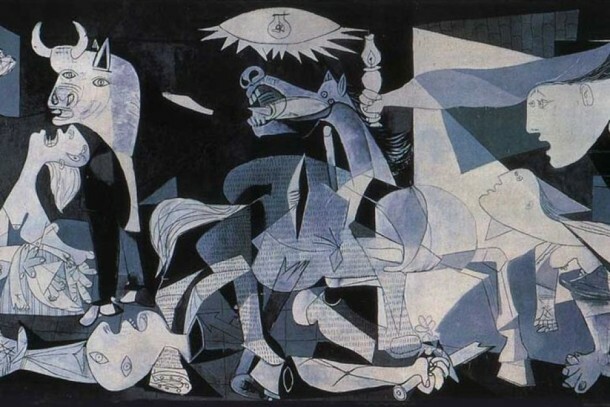 Guernica is inspired by an air raid by German aircraft on the Basque town of Guernica. It is a sharp indictment of the horrors of war and his most famous painting. The work is very expressionistic. That expressionism continues in subsequent work, for example, the portriats of Maya. In 1939 Guernica is exhibited in New York, Los Angeles, Chicago and San Francisco. There is a first retrospective exhibition at the Museum of Modern Art in New York. He makes a request to be a Frenchman, but is rejected because he might have communist sympathies. He moves to the Côte d’ Azur, Antibes. Meanwhile, he joined the Communist Party. He makes cheerful, airy paintings on the theme of ‘joie de vivre’. The ‘femme-fleur’ is often to be seen. In 1947 son Claude is born. It is also the starting point of his ceramic work. He visits Auschwitz and designs in 1949 the poster for the Peace Congress in Paris with La Paloma, the dove on it. He makes sculptures with recycled materials. From 1950 he will concentrate on his predecessors: the impressionists, Eugène Delacroix and Velázquez. He makes 44 variations on Las Meninas by Velázquez and several variants on Manet’s Le Déjeuner sur l’Herbe. He meets Jacqueline Roque. In 1955 Olga dies. 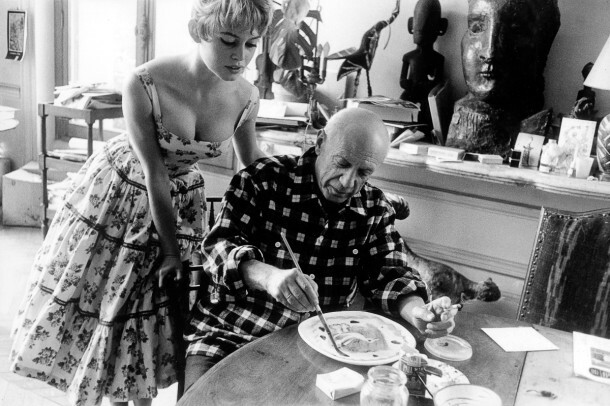 There’s a movie of Clouzot ‘Le mystere Picasso’. There is a retrospective in Moscow and Leningrad, and he continues with the Meninas by Velázquez. In 1960 he marries Jacqueline Roque. In 1963 the Picasso Museum in Barcelona opens. He donates all the works of his family. In 1970 he finishes with his last theme: ‘Le peintre et son model’, a subject he had tackled also early in his career. Meanwhile, he has broken with Claude and Paloma. On April 8, 1973 he dies in Mougins (Alpes-Maritimes), a village near Cannes. He is buried in Vauvenargues. 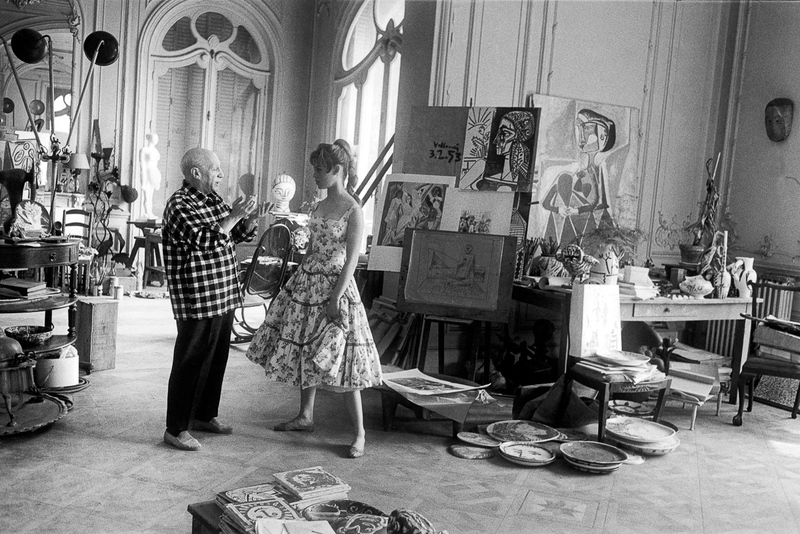 In 1985 the second Picasso Museum is opened – as desired by the artist- in Hotel Salé in Paris. With Les Demoiselles as example it is revealed in 1990 that Picasso had occult knowledge, in which symbolism of alchemy, Kabbalah, tarot and occult literature form the guideline. From 2004 Picasso’s work belongs to the top of the global art market. Some works have raised more than $ 100 million. 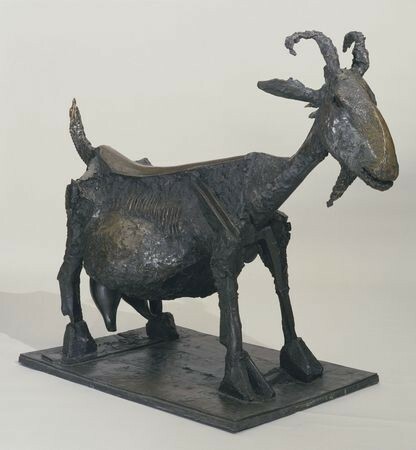 Of any artist so much work, more than 500, was stolen, according to the Art Loss register. Photos Picasso – Bardot: Jerome Brierre, LIFE Magazine.